I first got in touch with Dr Kakar in 2010 for an ulcer in the leg. I had an injury 2-3 years before and having Sickle Cell Anemia, the injury never healed. I went to many hospitals and doctors in Nigeria, till I got in touch with Dr Kakar. I came to India, Hyderabad and Dr Kakar arranged my stay in Hospital for a month. He operated me and also did my daily dressings himself. In 10 days of treatment I started healing and went back to Nigeria with some dressing materials which Dr Kakar told me how to use. He also got a stand made for me which I used for walking, because the bone was infected and he told me not to put pressure on the leg. Even after I went back, he kept in touch via email and telephone and guided me. He also sent dressing materials and medicines via courier. I healed in about six months after he started treating me and after that I was able to put weight on my leg fully. I am now fine. I would recommend Dr Kakar to anyone suffering for a long time with leg wounds. Thank you Sunmeet for your kind words. I am there for you whenever needed. I am Dr. Panchyal Roy Diabetologist by profession. 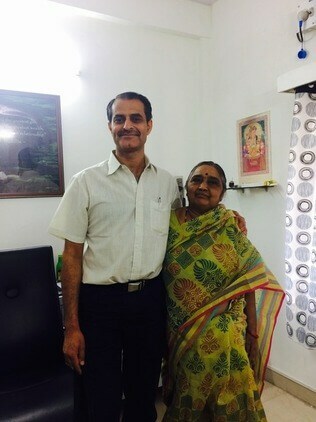 Last 4 yrs I have been in constant touch with Dr. Jayesh kakar for saving quit a number of diabetic feet from Amputation. I whole heartedly appreciate and Thank full to Dr. Jayesh kakar for his expertise in this deserted area of podiatric practice. Once he takes up any case he succeeds in saving legs. I have many success stories which I will convey in future. And he is my favourite foot care surgeon. Thanks Dr Panchyal for your faith in me. It has been a pleasure to be associated with you. Hope we carry on reducing the morbidity & mortality due to diabetic foot problems. Look forward to your continued support. It has been a good and nice experience and I really been very fortunate to get my father operated from him. Since I have shown my father to him.My Father is stable & Gud..Dr. Kakkar is very dedicated & committed to his Profession & his Patients. He has always communicated & responded very well with me when ever I needed him , even also at any odd hours..May God bless him wid all d sucess so that he can save d life of many people…… I whole heartedly appreciate and Thank full to Dr. Jayesh kakar for expertise in his practice. Once he takes up any case he succeeds in saving legs. And he is my favourite foot care surgeon. Thank you Priti for your kind words. I hope your father is well. It is almost 10 Years since we treated him. All the best to him. I’m R.pradesh Raju from bhimavaram where I got a non healing foot ulcer gangrene in my foot mostly about 2 months in a hospital where doctor said we are failed and it leg should be amputated. Me and my sons went to many big multi speciality hospitals in Hyderabad and my reports are even send to Bangalore all said that it should be amputated. Mentally me and my sons are prepared for amputation. Last hope finally the god shown a way that was dr.jayeshkakar he said that he will cure completely my leg with out any amputation. As he said he cured me completely he done the best treatment on my leg and i all my family members are awestruck now that I’m walking normally with my own two legs. Me and my family always trust his treatment and I suggested many people to him thank you sir. Thank you Pavani for so much praise. It may just go to my head. Hope your mother in law does not suffer from such problems again. I have known Dr. Kakar for many years. He had treated my father for his foot problems. He is a master of his profession and the personal attention he gives to each of his patients is a big reassurance of the quality of the care provided. Incidentally, a big number of patients that visit him come there after they haven’t found satisfactory cure elsewhere. He is known to treat the complex cases with ease. I have personally learnt a lot about foot care from him. Thanks Laxmikanth for your kind words. We got in touch with Dr. Kakar in 2014, for my father’s chronic paedal edema / eczema. It used to cause swelling and pus too. It was troubling him for last 8-10 years and we could not find any reasonable treatment, anywhere in country; including some of the renowned medical research institutes. Everyone treated it like a skin condition and attributed it to years of negligence and old age. It was a real difficult suffering for my father, who is otherwise very active and fit for his age at 70+. Going through some searches on Internet, I came through SaveLegs site of Dr. Kakar and in one meeting my Dad got a hope that this will be cured. We were impressed by precise method used by Dr. Kakar, which can really come through extensive experience. He recommended a simple scans and based on the results, a surgery was done. Everything done in 2 weeks time and then few more weeks for regular dressing etc. No medicine, no skin treatment and everything back to nearly normal. It’s been 2 years now and we sometimes are still surprised on how all this got treated so easily; almost when we lost all hopes. And we still meet Dr. Kakar occasionally whenever my parents are in town, as my parents trust him so much for all the advise he gives.